Whether your design aesthetic is boho chic or modern minimalist, you can step up your home décor game for holidays and special occasions with a cute, yarn pom-pom wreath that suits your style. The wreath technique shown here is easy to do and results in a cuddly, touchably soft pom pom wreath. There are no prickly pins, stiff metal wire, or sticky hot glue. 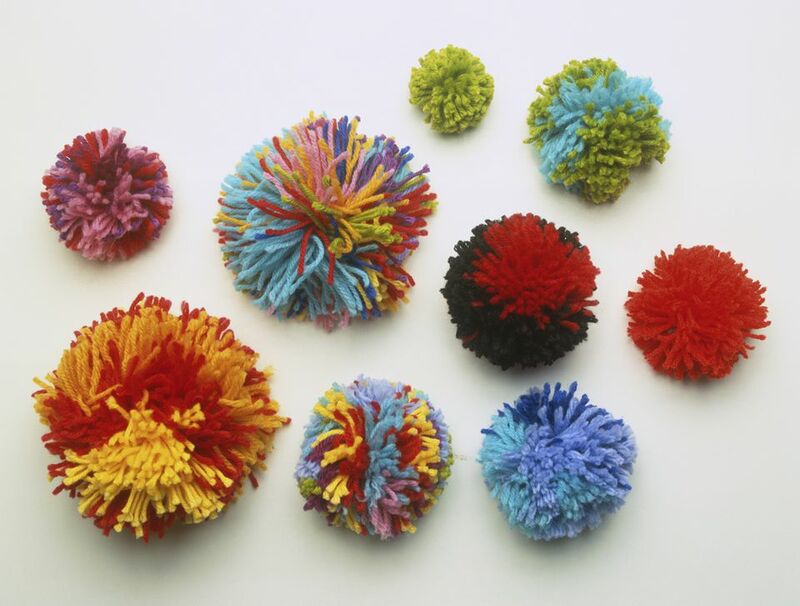 The individual pom poms are made with a simple pom-pom maker tool, which works better than a DIY cardboard tool. Yarn weight or worst indicates strand thickness. The term ply refers to the number of twists in a strand of yarn. In a nutshell, the fewer twists, the fuzzier the yarn. The red and magenta pom-pom on the left looks extra fluffy and downy because it consists of a single-ply yarn, which has only one twist in it. The yarn's fuzzy texture is perfect for making plush, cloudlike pom-poms. Yarn thickness also matters. The colorful orange pom-pom on the right resembles a popcorn ball because it was created using a thick, chunky yarn. If you want the individual strands in your pom-poms to pop and drape, go with a four-ply or higher yarn. Open the two curved arms on one half of the pom-pom tool, and wrap yarn around the curved sections of the arms (keeping the arms together), as shown on the right. Close the wrapped arm, then repeat with arms on the other half of the tool, as shown on the left. Tip: To ensure consistency in the size and shape of your pom-poms, make a few test pom-poms to determine how much yarn to use. Insert scissors into the tool's groove and cut the yarn, one side at a time. Tip: Regular household scissors may be too big for the pom-pom tool. If so, pick up a pair of small precision scissors designed for paper cutting. Tie off the pom-pom by inserting a piece of crochet thread into the slot on one half of the tool. Pull the thread tight and knot it. Flip the tool over, pull the thread tightly again, and double-knot it to prevent the wrapped yarn from loosening. Tip: Be sure to use crochet thread, which won't break easily like regular sewing thread. Crochet thread is also thinner than yarn and results in a fuller and rounder pom-pom. Open the pom-pom tool by pulling the two sides apart, and remove the pom-pom. Secure the double knot with a drop of fabric glue, then trim the extra crochet thread. Shape and fluff your pom-pom, using your hands. If it looks a tad imperfect, simply give it a trim with sharp scissors for a neater appearance. Repeat the same process to make as many pom-poms as you need for the wreath. Wrap yarn around the wreath frame as shown, making sure it looks nice on both sides. Knot the yarn, then secure the loose end with a dab of fabric glue on the pom-pom side of the frame. The pom-poms will cover the knot. Thread an embroidery needle with crochet thread. Create a loop at the opposite end of thread, and knot it. Pierce the pom-pom through its center, as shown. Pull the needle through the pom-pom, then run it through the loop and pull the thread tight to secure the thread to the pom-pom. Sew the pom-pom into place by looping the needle under one of the strands of yarn around the wreath form. If pom-pom feels too loose, run the needle and thread through the pom-pom again to tighten. Loop the needle under another strand of yarn, then run the thread through the next pom-pom and secure it to the wreath, as before. Repeat the same process to add the remaining pom-poms. Knot the end of the crochet thread, secure the knot with glue, and trim the end of the thread. This cuddly, white pom-pom wreath was made with a foam wreath frame and two skeins of Wool-Ease Thick and Quick by Lionbrand in Fisherman. You can create the pom-pom design by attaching a ring of pom-poms to the inner edge of the form around the circular opening, then adding a circle of pom-poms to the front facing side, and finally to the outer edge. 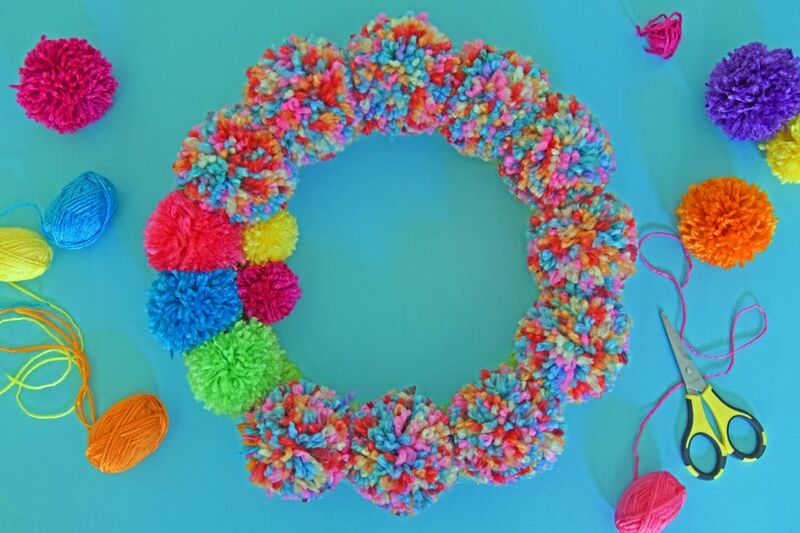 This confetti-inspired wreath was made using 10 large pom-poms created from one skein of Color Waves by Lionbrand in Ocean Drive and five small pom-poms in different colors plucked from a package of Bonbons by Lionbrand in Brights. You can make this boho-chic wreath using yarn remnants in different colors and textures. First, wrap a metal 12-inch wreath form with multi-color yarn, then cover half the frame with pom-poms.